Rubies are perhaps the most popular gems out there their color making them the perfect stone for those with fiery spirit and daring personalities. 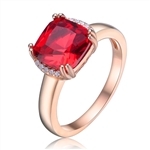 Take a look at out spectacular collection of Ruby Jewelry. 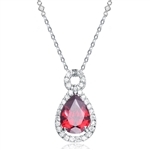 Whether you are fashion diva or man who looks for a significant gift for woman with fiery spirit the Diamond Essence Ruby Jewelry is the ideal choice. Diamond Essence 0.5 carat each, ruby stone set in 14K Gold Vermeil tubular bezel setting. 1.0 ct.t.w. Choice of 2 and 4 ct.t.w. available. Diamond Essence 0.5 carat each, ruby stone set in Platinum Plated Sterling Silver tubular bezel setting. 1.0 ct.t.w. Choice of 2 and 4 ct.t.w. available. 14K Gold Vermeil Little Ruby Flower Ring has a 0.13 Ct. Round cut Ruby Essence in the center, Circled by 8 Flawless Round Brilliant Diamond Essence stones. 0.33 Cts.T.W. . Simple but elegant, this 14K Gold Vermeil ring with Diamond Essence round brilliant stones and ruby stones. 1.2 cts.t.w. V-shaped rings of Ruby Diamond Essence jewels are beautiful on their own, or stack several to wear as a set. 1.0 ct. t.w. each. in 14K Gold Vermeil. Two Ruby Oval Essence, 0.5 ct. each, set in four prongs and surrounded by melee to give floral effect. 1.20 cts. t.w. In 14k Gold Vermeil. Ruby Essence Heart Pendant - 0.5 Cts. T.W. set in 14K Gold Vermeil. Gold Vermeil or Platinum Plated Sterling Silver, Three stone ring. Diamond Essence 2.0 carat round brilliant ruby stone in the center and 1.0 carat round brilliant stones on each side. 4.0 cts.t.w. Platinum Plated Sterling Silver Little Ruby Flower Ring has a 0.13 Ct. Round cut Ruby Essence in the center, Circled by 8 Flawless Round Brilliant Diamond Essence stones. 0.33 Cts.T.W. Simple but elegant, this Platinum Plated Sterling Silver ring with Diamond Essence round brilliant stones and ruby stones 1.2 cts.t.w. 14K Gold Vermeil Stunning Three Stone Ring with 1 Ct Oval Cut Ruby Essence Center and Diamond Essence Triangle on Each Side, 2 Cts.T.W. Two Ruby Oval Essence, 0.5 ct. each, set in four prongs and surrounded by melee to give floral effect. 1.20 cts. t.w. In Platinum Plated Sterling Silver. Diamond Essence delicate necklace with 2 carat Pear shape Ruby Essence with Diamond Essence melee around, on 18" long chain. 2.25 Cts.t.w in Platinum Plated Sterling Silver. 7 inches long Tennis Bracelet with Princess cut Diamond Essence and Ruby Essence stones , each stone of 0.20 ct. set in alternate group of 5 stones. 10.4 cts.t.w. in Platinum Plated Sterling Silver. Platinum Plated Sterling Silver, Three stone ring. Diamond Essence 2.0 carat round brilliant ruby stone in the center and 1.0 carat round brilliant stones on each side. 4.0 cts.t.w. Platinum Plated Over Sterling Silver Stunning Three Stone Ring with 1 Ct Oval Cut Ruby Essence Center and Diamond Essence Triangle on Each Side, 2 Cts.T.W. Dual Flowers - Curvy Band shines bright and Ruby Oval Flower Cluster sits pretty in this unique design. 2 Ct. T.W. In 14k Gold Vermeil. Star Light Star Bright for little ears. 0.05 carat each Ruby, Citrine, Turquoise, Amethyst and Diamond Essence stones set on each tip of Gold star. Let the little ears shine with this beautiful star earrings, 0.50 cts.t.w. in 14K Solid Yellow Gold. Designer Ring with 2.0 Cts. Marquise cut Ruby Essence in center accompanied by delicately set Marquise and Melee on each side. 3.0 Cts. T. W. set in 14K Gold Vermeil. 14K Gold Vermeil 3 Cts. Pear cut ruby essence sitting atop a princess cut masterpiece surrounded by 15 round brilliants, 4.0 Cts.T.W. The Ruby was a long time ago crowned ‘King Of Gems’, a tribute to its blood red intensity, believed to protect the wearer from evil, signify love and intense passion and also offer leadership skills and power of decision-making.The ruby was also believed to have curative properties and used to improve blood circulation. The blood-red stone is said to symbolize strength, vitality, confidence, leadership, and courage. The red ruby is associated with passion and love and it is associated with the Sun, and was believed by the ancients to preserve physical and mental health of an individual. Rubies were believed to purge the body of toxins, restore youth and vitality when rubbed on the skin.Diamond Essence has an impressive collection of ruby jewelry . Daring, classic, upbeat, trendy and most importantly high quality designs combine perfectly cut ruby stones with high end metal setting to result in a spctacular piece any July bord diva would treasure. Choose from our large selection of rings, earrings, pendants and bracelets or pick a ruby necklace to offer to a loved one.